BrewDogs hosts James Watt and Martin Dickie. A few months ago, producers of the Esquire Network show “BrewDogs” came calling on Against the Grain Brewery & Smokehouse. They found what they were looking for. It’s a fact: “BrewDogs” hosts James Watt and Martin Dickie, a pair of Scottish “beer evangelists,” are not known for playing it straight. Through the show, they travel from brewery to brewery, checking out new beers and brewing up locally inspired concoctions on site. The episode filmed last November will air Wednesday, April 15, at 10 p.m., the third episode of season three. Against the Grain will celebrate with a viewing party at the brewery starting at 7 p.m., followed by a pre-screening of the episode at 8:30. And while the Esquire crews were in town, they hit up a few other spots as well to feature on “Best Bars in America.” Hosts Jay Larson and Sean Best visited Churchill Downs, then made their way to Holy Grale, Four Roses Distillery, Old Seelbach Bar, Jack’s Lounge, Haymarket Whiskey Bar and Garage Bar. That episode will air at 9 p.m.
It’s probably safe to say that by 11 p.m. or so on Wednesday, the entire country is going to think Louisville is a bunch of drunks. But there are obvious benefits, especially with the Derby Festival upon us. Thousands of tourists will converge on Louisville over the next couple of weeks, and these shows will be quite the teaser. Wednesday’s viewing party also will include the official public release of the beer Against the Grain brewed with Watt and Dickie. Cruz said the beer, called We Mint Well!, is a “boozy” tribute to the mint julep, the drink of choice for Derby goers. It was aged in six different Kentucky bourbon barrels and infused with mint from Dohn & Dohn Farms, which provides the mint for juleps at Churchill Downs. The beer got its first breath of life during the filming wrap-up. On the show, the hosts and brewers drank their samples of We Mint Well! from silver julep cups handcrafted by Kentucky artisan Sally Wilson, while the rest in attendance — which packed the brewery’s tap room in the Slugger Field complex — enjoyed shot-sized samples. 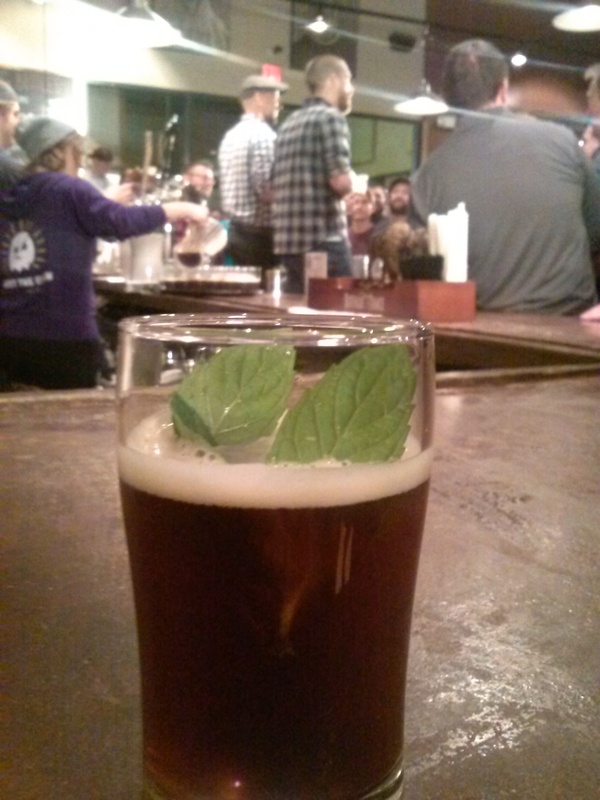 Suffice to say, it’s an extreme beer bursting with bourbon character, and comes garnished with mint for effect. Be careful if you drink more than one of this high-gravity bruiser. As for what viewers should expect from the show, Cruz said he hasn’t seen it either and doesn’t fully know what to expect himself. But the timing and tie-in are obvious wins for Kentucky brewers — bourbon is king, and pairing the state’s traditional favorite spirit with the up-and-coming popularity of local and regional craft beer can only help increase the latter’s growth, not just for Against the Grain, but for all the breweries in Louisville and across the state. “As we grow as a segment of the beverage industry, this attention is vital in securing talent and resources,” Cruz said. With more breweries opening all the time in Kentucky, it won’t be a surprise if we see the BrewDogs in town again one day.